Bleakcoast Cave is a small ice cave containing frost trolls, located southeast of Winterhold and directly east of the Shrine of Azura. The exterior of the cave more than explains the name with its dreary landscape and wood debris. 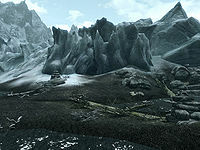 An iron ore vein can be found to the north of the entrance, on the shoreline, and a nirnroot grows nearby to the south. Skeletal remains are strewn about the outside of the cave, evidence of a large carnivore inside. The cave's circular main chamber holds two frost trolls and the grisly remains of the trolls' meals, but nothing of interest. A third frost troll is in the smaller chamber to the west. Here also are the corpses of a novice conjurer and a bandit with a small coin purse on the ground beside the bandit. On the novice's corpse you'll find a copy of the Two-handed skill book Battle of Sancre Tor. Next to him is an apothecary's satchel covered in blood. Another ancillary chamber is to the north. A skeletal torso is suspended, upside down from the ceiling with a random, enchanted greatsword lying underneath . A fourth frost troll is in the chamber ahead along with a dead Khajiit next to a medium coin purse. South of the cave entrance, a lonely hunter's camp can be seen across the water. The camp contains two small tents, each containing an unowned bed roll, the left-hand tent also contains a knapsack. There is a large coin purse on the back of a covered cart and a wooden table with an iron dagger, some horker meat and tusks, and a copy of the Light Armor skill book Rislav The Righteous on and around it. There is an unowned horse and dead horker by the campfire. From the small camp, head down to the water, follow the coast to the east, and just as it passes a huge broken ice floe on your left, you should find the remains of the camp's two hunters surrounded by three or four horkers. By now you will be southeast of Bleakcoast Cave. This page was last modified on 12 January 2019, at 04:37.